JOZO has been adding a pinch of love to lives since 1929. Our long history has made us master the skills of mining and grinding salt to perfection. With salt, you can bring flavors to life. Your dishes taste better and you will taste more flavors. 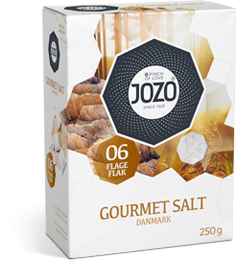 The pyramid-shaped salt flakes of JOZO 06 add a lovely subtle hint to salads, grilled vegetables, baked potatoes and sweet desserts. The shape and size of a salt grain determine the flavor impact. That is why JOZO salt is crystallized in various sizes. JOZO 06 salt flakes are used as a finishing touch in dishes, allowing you to enjoy their true delicate flavor and excellent crunch.